Hispanic Connecticutians are Americans of Spanish and Portuguese and New World descent sampled in the state of Connecticut. A small number of Hispanics live in East Haven, a predominately Italian-American town. The Hispanic – Connecticut population data represent DNA samples from 187 Hispanic (Hispanic and Latino Americans) individuals in the state of Connecticut (Demographic Profile of Hispanics in Connecticut). 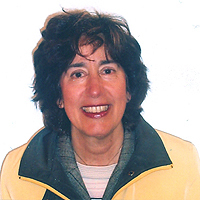 Photo: Julia A. Kushigian teaches Hispanic studies at Connecticut College.